Wow!! 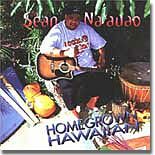 A Na Hoku Award winner in 1998 - Sean Na'auao does it once again with his newest hit album. This has five original songs written by Sean. Hawaiian contemporary/Pop music at its finest. Del Beazley's "Punani Patrol" is a most requested hit. We've selected a few of our favorites to give you a brief glimpse. A real upbeat, fun album, we can't stop dancing to his beat.